Floyd Fithian, 74, a Democrat who was a former Indiana congressman and chief of staff to then-Senator Paul Simon (D-Ill.), died June 27, 2003, at his home in Springfield,Illinois. He had Parkinson's disease. Mr. Fithian served in the House of Representatives from 1975 to 1983. During his years in the House, he served on the Small Business, Government Operations, Foreign Affairs and Agriculture committees. In 1982, after a Republican redistricting, Mr. Fithian announced he was retiring from the House to run for statewide office. After beginning a run for Indiana secretary of state, he withdrew from that race and made an unsuccessful run for the U.S. Senate seat held by Republican incumbent Richard Lugar. In 1983 and 1984, Mr. Fithian was finance director of the Democratic Senate Campaign Committee. He was staff chief to Sen. Simon from 1985 to 1996, and then served as board secretary of the Farm Credit Administration until retiring in the late 1990s. Mr. Fithian, a graduate of Peru State College in his native Nebraska, received master's and doctoral degrees in history from the University of Nebraska. He served in the Navy from 1951 to 1955 and retired from the Reserve in 1971. He taught high school in California from 1955 to 1959, then taught history at Nebraska Wesleyan University until serving as an associate professor of history at Purdue University from 1964 to 1974, when he was elected to Congress. He made an unsuccessful run for Congress in 1972. Mr. Fithian was a past president of the Indiana Council for Social Studies and the author of technical articles and books. Survivors include his wife, Marjorie, of Springfield; a son, John, of Alexandria; two daughters, Cindy Fithian of Fairfax and Judy Heuss of Indianapolis; a brother; three sisters; and eight grandchildren. Floyd Fithian, former Indiana Democratic Congressman and chief of staff to then-Senator Paul Simon (D-Ill) died June 27, 2003 at his home in Springfield, Virginia. He had Parkinson's disease. 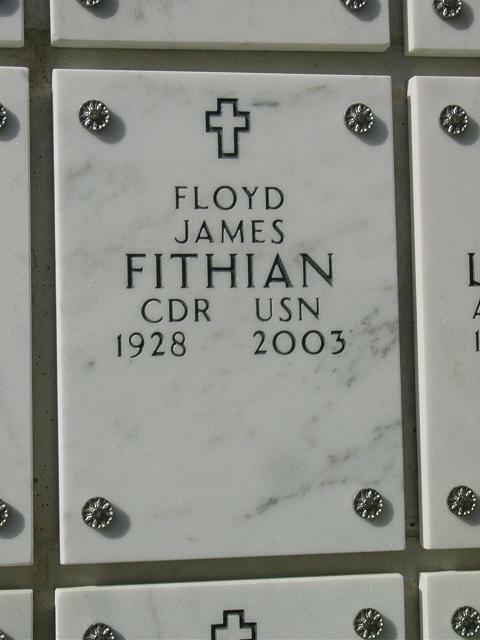 Mr. Fithian also served as a teacher and history professor; worked for the Farm Credit Administration, and retired from the Navy with the rank of Commander. Survivors include his beloved wife, Marjorie of Springfield; two daughters, Cindy Fithian of Fairfax, VA and Judy Heuss of Indianapolis, IN; a son, John of Alexandria, VA; a brother, three sisters and eight grandchildren. A life celebration service will be held on Thursday, July 3 at 1:30 p.m. at Little River United Church of Christ, 8410 Little River Turnpike, Annandale, VA. Interment will occur at a later date at Arlington National Cemetery. Donations may be made in honor of Mr. Fithian to Peru State College Foundation, P.O. Box 10, 600 Hoyt Street, Peru, NE 68421. FITHIAN, Floyd James, a Representative from Indiana; born in Vesta, Johnson County, Nebraska, November 3, 1928; graduated from Vesta High School, Vesta, Nebraska, 1947; B.A., Peru State College, Peru, Nebraska, 1951; M.A., University of Nebraska, 1955; Ph.D., University of Nebraska, 1964; teacher; engaged in agricultural pursuits; United States Navy, 1951-1955; United States Navy Reserve, 1955-1971; unsuccessful candidate for Congress to the Ninety-third Congress in 1972; elected as a Democrat to the Ninety-fourth and to the three succeeding Congresses (January 3, 1975-January 3, 1983); was not a candidate in 1982 for reelection, but was an unsuccessful candidate for election to the United States Senate; staff for Senator Paul Simon of Illinois; died on June 27, 2003, in Annandale, Virginia.